Zimbabwe have picked three uncapped players in a squad of 27 to train together in preparation for the home ODI series against the UAE, to be played next month. 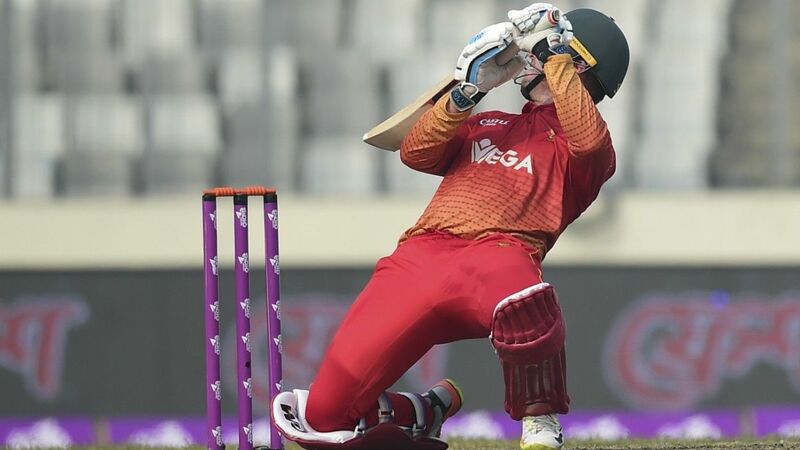 Star batsman Brendan Taylor, whose stint with Lahore Qalandars in the PSL was cut short by a calf injury, is also part of the squad, suggesting that he will have returned to full fitness ahead of the first ODI on April 10. Two of the uncapped players – left-arm spinner Ainsley Ndlovu and middle-order batsman Charles Kunje – play for Matabeleland Tuskers, while offspinner Tony Munyonga debuted for Rising Stars last season and has since moved to Eagles. Some familiar names from the fringes also returned to the mix: batsmen Roy Kaia and Timycen Maruma, wicketkeepers Richmond Mutumbami and Regis Chakabva, and legspinner Natsai M’shwangwe have all been recalled on the strength of their performances this season in franchise cricket. Kaia, Chakabva and Maruma all scored hundreds in the Pro50 tournament, while Maruma was also the leading runscorer in the Logan Cup, where he guided Mountaineers to the title with 409 runs at 81.80. Also returning to the national frame is fast bowler Carl Mumba. Mumba was on the sidelines for a year after seriously injuring his knee during Zimbabwe’s tour of Sri Lanka in 2017, but marked his return to professional cricket with 8 for 24 in a Logan Cup match at the beginning of the season, and could now force his way back into the national team. The experienced core of the national team is in place: captain Hamilton Masakadza, Sikandar Raza, Sean Williams, Tendai Chatara, Kyle Jarvis, Elton Chigumbura and Craig Ervine, who will head into the training camp in red-hot limited overs form. Ervine stormed through the Pro50 and Domestic T20 competitions, averaging 211 at better than a run a ball as he topped the local fifty-over batting chart, and carried that form into the T20s, during which he was again leading run-scorer as he powered Tuskers to the title with 328 runs at a strike rate of 154.71. There were also a couple of notable absences from the squad, with hard-hitting opener Cephas Zhuwao overlooked and left-arm spinner Wellington Masakadza unable to force his way in despite decent domestic limited-overs returns. Batsman Tarisai Musakanda has also fallen out of favour after an unspectacular season, while seamer Daniel Jakiel has not been called upon despite topping the Pro50 bowling table with 13 wickets at 11.84. The ODIs against UAE are scheduled for April 10, 12, 14 and 16, all at Harare Sports Club. Before the series gets underway, UAE will face Zimbabwe A in a 50-over warm-up match at Old Hararians Sports Club on April 8, two days after their arrival in the country.